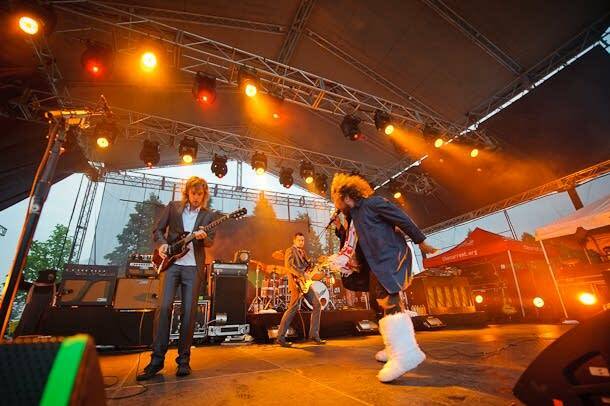 As evidenced by their finale performance at Rock the Garden 2011, My Morning Jacket knows how to rock an outdoor concert ... but do they have what it takes to rock the radio as well? We decided to find out. On the morning of My Morning Jacket's show at the Somerset Amphitheater with Trampled by Turtles and Band of Horses — two other favorites of The Current — frontman Jim James stopped by The Morning Show to hijack the airwaves and play a block of his favorite music. 1. My Morning Jacket - "Outta My System"
8. My Morning Jacket - "Circuital"
My Morning Jacket - "Outta My System"
Beny More - "La Culebra"
Willie Hutch - "I Choose You"